This hand-assembled, wood topographical map shows the contours and 3D details of your favorite lake. A lake is more than just a body of water. Transport yourself back to the tree-lined oasis you splashed in every summer with this wood wall art. 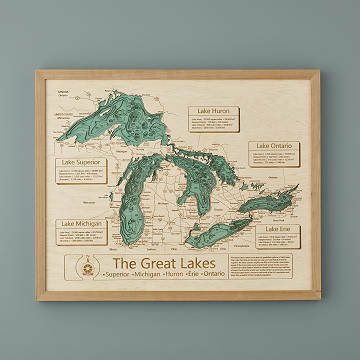 Captivating in its detail, this informative design features a three-dimensional map that recreates your favorite lakeside getaway in painted birch plywood. Each bathymetric piece drinks deeply from traditional studies of the earth's surface, displaying up to eight levels of the waters' depths on terraced sheets of wood. Surrounding roads, towns and state lines give context and show how vast lake systems (such as the Great Lakes) connect to neighboring states. Looking for something a little simpler? The smaller iteration of this lake design tells the water's history in one-dimension. With over 4,000 lakes and coastal regions available, you're bound to find a favorite to display with pride or to pass along as a treasured keepsake. Pieces are laser-cut, hand-assembled, and framed in an oak shadowbox in Harbor Springs, Michigan. Click here to see the complete list of lakes and coastal regions. Dust frame with a soft cloth, clean glass with soft cloth and glass cleaner. Based on the orientation of the lakes chosen, some measurements will be opposite. For example based on orientation of lakes art work could be either 16x20 or 20x16. Level of detail will vary based on lake chosen. Please note that the 8 x 10 size is one dimensional, and topographical information is shown with one level of laser cutting, as opposed to multiple levels. I bought this piece as a surprise for my husband. We just bought an island home and I thought this might be an interesting and unique piece to display. The colors are a perfect match to our existing decor and it's of excellent quality. We are delighted with it! Great product and well constructed. The only thing I would change, would be add more of a selection in framing options (different colors and styles). This map will certainly be a conversation piece at our lake house. Very glad with our purchase, it's beautiful. This is such a beautiful piece it adds style to any room. The 16x20 is a perfect size for a smaller area. This was the best gift I have ever given. It was for my dad of the lake our cabin is on. I can never find anything with our cabins town or lake because it is small and private. So this was wonderful. Giving this to my boss as a retirement gift. Hopefully he'll hang it in his cabin on the lake! Lake Topography... Done So Well! Perfect Gift for the person that has everything. I have bought three of them! Fits in perfectly with the character of our home.